These are fun, and kid-friendly little bites of deliciousness. You can use a regular muffin tin if you grease carefully, but if you pick up one of the new flexi-tray products that are rubber-like, you won't have to use grease to keep them from sticking. Heat your oven to 375. Using the olive oil, saute your mushrooms and set aside. Using the same saute pan that you used for your mushrooms, combine spinach and 1/4 cup water; cook spinach until just wilted. Scoop spinach out of saute pan and press water out through a colander or sieve. 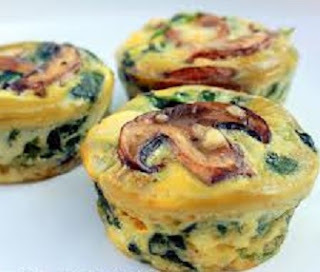 Combine all ingredients and fill muffin tin. Bake for 20-25 minutes or until a toothpick inserted in the center comes out clean. Cauliflower is so mild and sweet, that prepared correctly, even the pickiest kid will often enjoy this recipe. Preheat your oven to 450 degrees. Use a little of your olive oil to grease a large casserole dish. 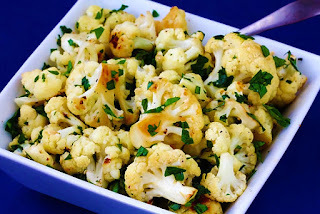 In a bowl , mix cauliflower and ingredients except cheese and cilantro. Bake for 25 minutes, stirring halfway through. Then top with your cheese and cilantro, and broil for 3-5 minutes until golden brown. 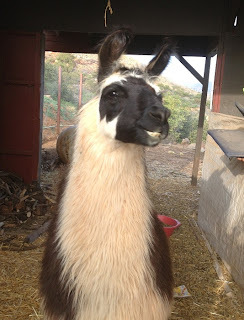 Couscou looks out from his barn that he grudgingly shares with the farm's dairy goats. Yet another way to enjoy your butternut squash! You need to start this recipe with a cooked squash. You can microwave it in pieces until soft, or bake at 350 for 45-60 minutes. Either way, cut at least in half, (smaller pieces cook faster) scoop out seeds and place in a dish of water. After it's cooked to roughly the softness of a cooked potato, remove, cool enough to handle and scoop out into a bowl. Put garlic, honey, spices and dash of hot sauce in Cuisinart or other blender and blend until smooth. In a pan of boiling water, steam chopped up kale until just slightly soft. Happy 1st Birthday, Princiess Boo! 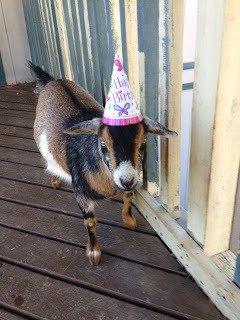 We weren't sure how Boo's first birthday party would pan out... as, well...you never quite know with a spoiled-beyond belief miniature goat with a mind of her own. Lance made quite the deal out of it, certainly more than he's made out of any one else's birthday around here for a while. Ha ha! There never was a prouder goat owner, that's for sure. He even went to a bakery and picked up a healthy blueberry muffin for her birthday cake. No unhealthy frosting here! Boo didn't want anything to do with her "goat cake," unfortunately, and her other guests stomped right over it to get to that tasty looking book.